My mom helping me get ready for my wedding day in 2012. This is the final post in my Mother's Day series (nevermind that it's June), and to say that this one is special to me would be an understatement. Today, I have the pleasure of chatting with the most amazing mom I know - my own. Until I became a mother myself four years ago, I didn't truly understand or appreciate all the sacrifices my mother made to raise me and my siblings. In some respects, I still don't understand fully - I only have two kids and she had five. Can you even imagine? It's no secret that large families are becoming the exception in modern society. According to the Pew Research Center, the average number of children per household has shrunk from four to two since the 1970s as education among women has increased, and only 14 percent of all moms nationally have three or more children. Still, the Bible rings true in Psalm 103:4-5: "Like arrows in the hands of a warrior are children born in one’s youth. Blessed is the man whose quiver is full of them." In today's post, my mom shares battle-tested wisdom for anyone thinking about having a child or growing their family. Read on to learn more about her journey to and through motherhood. And mom, to you and the millions of women like you, laying down their lives every day to shepherd half a dozen little hearts or more, you are appreciated. I love you beyond words. For more than two decades, my mom was a stay-at-home mother of five children, two girls and three boys. She has always called her children her "first ministry." Born in New Jersey, she moved to Maryland with her husband, Art, in 1990, leaving behind her entire family and support system and wholeheartedly investing herself in discipling me and my siblings. From becoming PTA president at school to leading children's Bible Study at church, wherever we were plugged in, she plugged in too. Today, she's an empty-nester and mother of eight grandchildren (and counting.) She frequently jokes that she's still "recovering" from raising five kids, although we all know she's hardly joking :-) She's undoubtedly the most beautiful, most resilient, most Godly woman I know. Q: Was it always your goal to have a big family? How did you end up with five kids? A: Ha! No, it wasn’t my goal. I actually never had an affinity for children. I never babysat, I was never interested in babysitting, and I didn’t want any kids. As a matter of fact, the first time I ever watched a baby, I changed her diaper (we used cloth diapers held together by pins back then), and accidentally stuck her with the pin, which made her cry. The worst part was that the pin actually penetrated part of her skin. I was really scared. Once I took it out, she was fine (she didn’t even bleed), but I was even more convinced then that I didn’t want children. Moving forward, I believe it was God who called me to motherhood. It’s not something I went into saying, 'I want this,' but His word says who He calls, He also equips (Hebrews 13:21). I ended up having my first two children at a young age, and I learned that God gives you a love for your own. With my oldest daughter, I was unprepared. My mom watched her a lot of the time. When I got pregnant the second time with a son, I got more involved in parenting and God opened my heart to something I never really fathomed myself doing..
After I came to the Lord and got married, I wasn’t really sold on taking birth control and neither was my husband. We just agreed that if God gave us children, we would have children. It’s funny because he didn’t think kids liked him, but he wanted a big family. Even though I didn’t necessarily share his desire for a large family, I trusted that if that’s what God envisioned for us, I would follow. We left the decision in His hands knowing that He is the creator of all life. 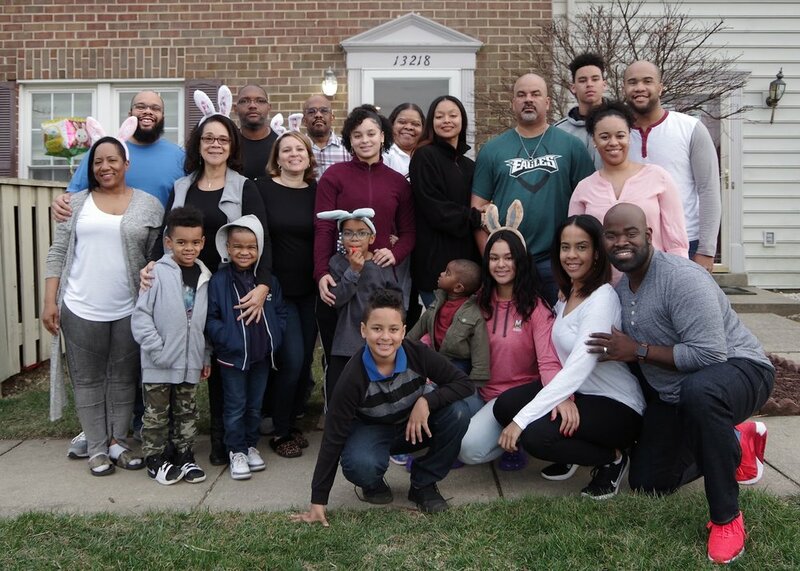 My mom pictured with her husband, five kids, five daughters and sons-in-law, and eight grandchildren at Easter, 2018. Q: What has been the biggest challenge of motherhood? A: The biggest challenge is also the biggest blessing: being responsible for the gift. In motherhood, you partner with God in shaping your children to be worshippers of God first and good citizens, second. As a parent, you’re responsible for your child’s instruction and correction. You’re not responsible for who they become, but you’re responsible for what goes on while you’re with them. That’s a heavy weight, but it’s also a beautiful gift. My mother taught me early on that it was my responsibility to raise my children. She didn’t take that responsibility away from me by making parenting easy on me. I realized from a young age that I was responsible for how my children were raised, where they lived, what clothes they wore and how they responded to others. It was a big challenge. It’s hard enough being responsible for yourself. Try adding five kids! Through it all, I've tried to raise my children as unto the Lord, so that when I stand before him and He asks what I did I with the gifts He gave me, I can say I did the best I could and was obedient to what He told me to do. Q: What gave you the strength to keep going when it got hard? A: My relationship with the Lord and my time spent on bended knee. He was and still is my rock, my counselor and my fortress. The Holy Spirit guided me and gave me strength to tackle everything that came my way. I clung to His word when times got hard, and I trusted that He would do what He said. I called on Him and He answered me with each struggle and with each child. All of my children had different personalities and different problems, but I was just one person. It was His guidance, insight and wisdom that helped me respond to each child individually. Psalm 121:2 says, “all my help comes from the Lord,” and that was true for me. Sometimes I didn’t know what to do, but when I trusted Him, I found Him to be faithful in leading me. Q: What has been the greatest joy of motherhood? A: I think the greatest joy of motherhood was seeing all my children come to Jesus Christ. I never told my children to accept Jesus Christ, the decision was their own, but He gave me a gift, and I got to see it unwrapped. It has been a joy to see them go on to live for God and obey His word. They’re not perfect, but compared to all their successes and accomplishments, there is no greater joy (3 John 1:4). Q: What would you say to someone with one or two children who wants more, but is worried about the financial costs and time constraints of raising more kids? A: If you can trust God to give you the time and resources to care for one or two children, you can trust Him to do the same thing with more. He’s the same God! His providential care is not limited by the number of children you have. That doesn’t mean it won’t cost you something. You may have to give up some material things. But His promise to provide for all your needs according to His riches in glory (Philippians 4:19) is the same. It’s not restricted to a number. If you’re not having kids because you’re worried about not being able to give them everything, maybe your focus is on giving them too much. We’re not called to give our children everything they want in this life. We’re called to get them to focus on knowing Christ. They don’t need more things. They need more of you. If you’re not having kids because you’re worried you don’t have enough time, remember that we make time for what’s important to us. You make time for your job, your friendships and your hobbies. There is time, you just have to appropriate it and make your children a priority. Remember, being a mother is a sacrifice. It will cost you, but God’s promises are big enough for however many children He allows you to have in whatever circumstance you find yourself. Q: What do you wish you knew at the beginning of motherhood that you know now? A: The only thing I would say is I would have wanted to know how much it was going to cost. No one tells you that, and I’m not talking about money. I’m talking about how much of yourself you give away sacrificially to your children. We’re talking about cost in terms of time, strength and how it drains you. Even when you feel like you can’t go any further, you put one foot on the floor and then the other, and get up and do it all over again each day. There’s nothing a real mother wouldn’t do for her child. That's because when you become a mother, your entire life changes. It’s not about you anymore. Your motivation and your whole psyche changes. You give your children the best of yourself because you love them.. Some people say you can be a mother and still do it all, but at what cost? Everything you do in this life is going to cost you something! The biggest thing people don’t think about when it comes to having children is the lifelong cost. A lot of people want the gift, but they don’t want to count the cost of taking care of it. I believe God kept the cost from me because I might have said, I can’t do it. There were many times I thought I couldn’t do it. I KNOW I could have never done it without Jesus Christ in my life! Q: What has motherhood taught you about yourself? A: Wow. This question made me tear up because when I look at my life, I guess motherhood has taught me that I’m stronger and more than I thought I was. As a stay-at-home mom It’s easy to feel like you never really accomplished anything. In motherhood, God showed me a purpose. Though hard at times, being a mom and parenting my children, became my passion. The Lord enabled me to do what I didn’t want to unto His glory. There’s a worth God saw in me to give me this ministry, and that’s how I viewed my children, as my first ministry. I’m humbled that He felt me worthy of the charge.